Pitchers today are throwing harder than ever. At all levels of the game. And at younger and younger ages. But there's no free lunch. The problem is these velocity increases are being achieved through the use of a number of tricks, cues, and drills that work by overloading the arm. It's the equivalent of running a car engine past the red line; the red line exists for a reason, and if you ignore it, you will pay the price. The difference is that, while you can easily replace a blown engine, there's no guarantee that you will be able to replace a blown elbow, especially if it blows out more than once, and God help you if you blow out your shoulder. Prior to the 1990s or so, most young ballplayers weren't taught much in terms of the mechanics of throwing or pitching. They largely just did what came naturally. Today, increasing numbers of ballplayers are being taught to throw and pitch using a number of problematic pitching cues and drills. Things have gotten crazy enough that things that reduce the risk of elbow and shoulder pain are now being labelled as flaws. Cues and drills that push the arm to, and often past, the red line. Rapid velocity gains that outpace the body’s ability to make adaptive changes. The use of these cues and drills on younger and younger players. ...and you have the pitcher injury and Tommy John Surgery epidemic. Since 2005, I have been studying the mechanics of pitchers who were both dominant AND durable, learning their secrets and understanding how and why the conventional wisdom about pitching keeps pitchers from moving the way the greats did and drives up injury rates as a result. This webbook is the product of that effort. While I initially focused on positions like the Inverted W as the possible culprit, by late 2007 -- and due in large part to the fact that pitchers like Tom Glavine made the Inverted W but stayed healthy -- I came to focus on Timing. The collage below sums up and makes clear a term I have started using, which is Flat Arm Syndrome. Notice how the arms of the Dominant and Durable pitchers, all of whom are current or likely Hall-Of-Famers, are UP at foot plant. In contrast, the arms of the other pitchers, all of whom have had injury problems, are FLAT at foot plant. You can see the same thing if you compare Jose Fernandez's pitching mechanics to those of Tom Seaver and Nolan Ryan at the Ready Position. In the current definition, that second qualifier has been dropped. Case in point, when I first dove into pitching mechanics in 2005, I did so by reading literally every study I could get my hands on. One of the studies I came across is the one below, which contains perhaps the most telling quote I have yet to come across. If a mechanical "flaw" reduces the risk of elbow or shoulder pain, how exactly is it a flaw? What quotes like the one above tell me is that peoples' preconceived notions of what constitute proper pitching mechanics have changed and are (literally) preventing them from seeing what the research is trying to tell them. That's the only explanation why four things that reduce the incidence of elbow and shoulder pain are classified as "flaws." Part of the problem is that Tommy John Surgery has removed much of the fear of injury, proper pitching mechanics are anything that quickly let you throw hard(er). What are proper pitching mechanics? Those that help you throw hard. How do you know if someone has proper pitching mechanics? They throw hard. The problem is that pitchers (and throwers) are being taught using any number of tricks, shortcuts, and drills that do help them throw harder -- which is why they are used and why pitching velocities are up -- but that, in my opinion, have significant, negative injury implications. Above all else, the problem that we are facing results from a nearly exclusive fixation on velocity, and increasing it quickly. Velocity sells to both coaches and scouts. As a result, pitching coaches are doing everything they can to increase their pitchers' velocity, pretty much regardless of the consequences. That is a problem because, as a pitcher's velocity goes up, so too does the load on their elbow and shoulder. The harder pitchers throw, the greater the risk they face. That risk is multiplied when velocity gains occur quickly, because that keeps the body from adapting to the greater velocity and force. The larger problem is that many of the pitching velocity increases that we are seeing of late are the result of the use of a number of shortcuts. And you know what your coach said about shortcuts. While these shortcuts are increasingly being labelled as proper pitching and throwing mechanics -- in large part because they do help pitchers achieve velocity increases -- they are not what the best pitchers actually do. Or, more accurately, used to do. Of course, part of the problems that we are seeing are due to my old nemesis the Inverted W and the other inverted arm actions. The fact is that the Inverted W does work -- the Inverted W is a pretty much guaranteed way of giving a pitcher a velocity boost -- which is why so many people (still) teach it. But it does so at a price. In many cases, the Inverted W creates a Timing problem that significantly increases the load on -- and too often overloads -- the pitcher's elbow and shoulder. In terms of new developments with respect to the Inverted W, as I discuss in my piece on The Science Behind the Inverted W, a recent study of the Inverted W confirmed that there is in fact a relationship between the timing problem that the Inverted W (is designed to) create and a pitcher's risk of injury. In my opinion, the bigger, and to date largely unaddressed, part of the story is that there are a number of other cues that baseball coaches and pitching coaches are using, and that are increasingly widely regarded as proper throwing and/or pitching mechanics, that are actually problematic. While I believe these cues will help ballplayers throw harder, I also believe they are contributing to the current plague of elbow injuries because, like the Inverted W, these cues create a timing problem that increases the load on the elbow and the shoulder. I discuss all of these cues in Killer Cues and Pitching MRSA, but let me discuss some of the more timely ones below. 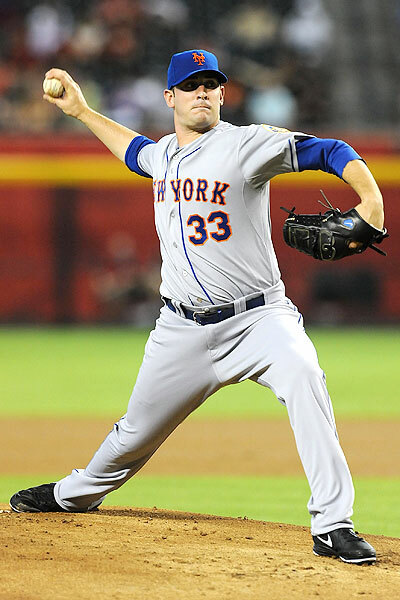 As I explain in my piece on Matt Harvey's pitching mechanics, I first came into contact with Matt Harvey when his father contacted me back in 2007 to have me take a look at Matt's pitching mechanics and make sure that he didn't have the Inverted W or any other obvious problems. I pronounced Matt clean at the time. However, at some point after I looked at him -- I believe it happened later on in college or in the minor leagues -- someone taught Matt Harvey a trick. They taught him to keep his fingers on top of the ball as long as he could and to make his arm swing as long as possible. The result was a timing problem that gave Matt Harvey a velocity boost but that in my opinion also increased the load on his elbow (and most likely also his shoulder). What's worse, products are now being created to reinforce the cue that I believe damaged Matt Harvey's elbow. 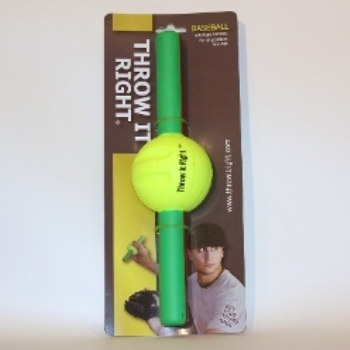 Yes, this product may help ballplayers throw the ball harder in the short term. However, I believe that products like this may increase the risk of elbow problems in the long term. 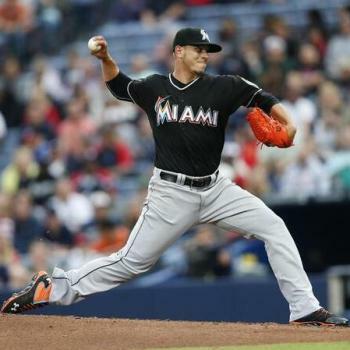 In terms of other pitchers who I think could fall victim to the elbow injury epidemic, the picture below of Jose Fernandez was recently brought to my attention by a reader. Unfortunately for Jose Fernandez and Marlins fans, this picture shows both premature pronation and a resulting timing problem. While this arm action may improve both Jose Fernandez's velocity and his stuff, it will most likely also lead to elbow and shoulder problems. NOTE: As I discuss in my piece on Jose Fernandez's pitching mechanics, this section was written before Jose Fernandez's elbow problems flared up. There is no doubt that overuse is part of the problem with injuries to young pitchers. In terms of kids, the simple fact is that kids aren't just shorter, skinnier adults. Instead, kids are fundamentally different; they have immature skeletal systems and have to be handled differently as a result. That is why the best possible advice for adult ballplayers -- throw as much as possible -- is not good advice for kids. However, I do not believe that abuse is the sole explanation for the problems that we are seeing in both youth and adult pitchers, especially since we know that pitching and throwing instruction has changed over the past 20 years. Instead, I believe that, for both kids and adults, the real problem with abuse comes when you combine poor pitching mechanics and the use of any number of problematic cues, tricks, and shortcuts with abuse. Think Mark Prior (and Dusty Baker). That said, it seems to be just as true that proper pitching mechanics seem to enable adult pitchers to tolerate some level of abuse. One of the things that turned me off about PAP and PAP3 was that Randy Johnson -- a pitcher who never had a serious arm problem -- consistently appeared at the top of the abuse lists. Of course, if you compare Mark Prior and Randy Johnson, you will see two pitchers who looked superficially similar but who moved totally differently. The problem with many of the cues that I discuss above is that, as in the case of Jaime Garcia, the thing that first gets the elbow then gets the shoulder. As a result, I believe that the current wave of elbow problems will turn into a epidemic of shoulder problems in three to five years as these pitchers get over their elbow problems and their shoulders then begin to wear out. What should you be teaching your ballplayers and pitchers to keep them on track? The Epidemic answers part of that question, by pointing out the Killer Cues and Drills that are robbing pitchers of their athleticism and forcing them into problematic movement patterns like the Inverted W.
In general, my approach to teaching pitchers falls under the heading of Dominant & Durable. I've spent 10 years studying pitchers who were both injury-free and had long careers and figuring out their secrets. The place to start is my webbook on Proper Throwing Mechanics. To access all of my information, you must first become a client. 1. To his credit, Dr. Mike Marshall was one of, if not the first, people to understand the negative implications of what is currently being taught in terms of throwing and pitching mechanics. Unfortunately, Marshall is an absolutely miserable communicator; he refuses to use the common vernacular of pitching and uses non-standard physiological terminology, among other things. As a result, pretty much nobody, myself included, understood exactly what he was talking about. There's also the issue that it's debatable whether Marshall's proposed solutions will actually fix the problem without introducing a whole new set of problems. In order to ensure that the information contained in The Epidemic is available to everyone who needs it, much of the information in The Epidemic is available for free. However, researching pitching and hitting is the only thing I do for a living, so the most important and valuable content is only available to those who have purchased access to The Epidemic or to my Power/Advanced Pitching clients.